For several years now, I have made a practice of ReGifting during the holiday season. My children have come to expect ReGifts. After rolling his eyes the first year I ReGifted, my husband has even hopped on board. What is a ReGift? It's a gift given that was neither purchased new nor made by hand. It's something you already have given back to you with Newness. Maybe it was something that was broken and is now fixed. Maybe it's something you never use and forgot about, but someone found it and thought you might start using it again. A ReGift might also be something you give that was already yours, but you give it with love; more than just a hand-me-down. Or, maybe it's something that the receiver of the gift already had, but you wanted to give the gift again, giving it with new meaning. I remember one year Corey was so bogged down with work that he only had time to pop into a nearby store to do any Christmas shopping for me. 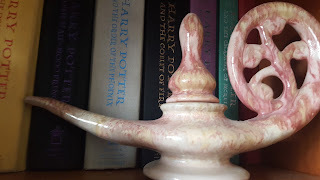 He bought me a Pink Oil Lamp; as in "rub the lamp and a genie will appear" sort of lamp). While it was novel and unexpected, it felt forced. It felt like he had not put much thought into my gift and wanted to "just get me something". So, while I displayed my lamp on the shelf, every time I looked at it, I was reminded of those negative feelings. The second year of ReGifting, Corey ReGifted me the Pink Genie Lamp. I had been doing bellydance for almost a year at that point. He ReGifted me the Pink Genie Lamp to recognize my hard work and love of bellydance. Receiving the ReGift changed the way I felt when I looked at the Lamp from then on. Instead of it being a constant reminder of his lack of attention, it became a trophy of his appreciation for my hobby. ReGifting also represents an appreciation for what we already have. If you don't want to contribute to the OverCommercialization of Christmas, put your Fun Dollars where your mouth is. Be thankful for what you already have. Find appreciation in gifts already given. Find ways to make gifts new for those you love. Give stuff you already have. When my best friend moved across the country, I didn't get her a going away present. I knew she already had enough to pack. Instead, I left a Sephora bag at her house the last time I saw her. I didn't say anything about it. I didn't tell her where it was, she just found it while packing. The Black and White Striped bag contained the dress she borrowed from my closet for Halloween 2010. It was originally my graduation dress; black velvet, cocktail length with glitter disco balls, open back... I held onto it for so many years but never wore it. The one person who did wear it was my best friend. 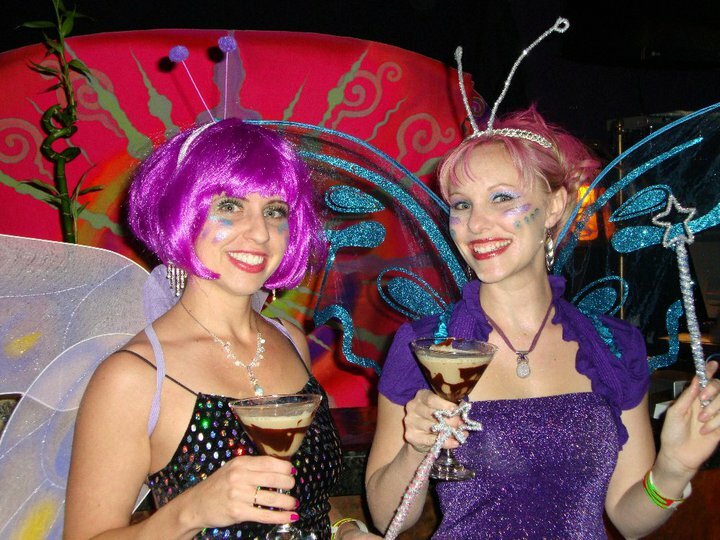 She and I dressed up as fairies after taking our kids trick-or-treating. We were chauffeured to (and picked up from) the local dance hall by my husband. (He stayed at home with our sons so that we could have a Girls' Night Out.) Oh the Chocotinis we enjoyed!!!! The Sephora Bag also included a few other items that could be used for an "emergency Girls' Night Out", all of which came from my closet as ReGifts. When I gave her those gifts, I wasn't giving her "things", I was giving her a memory. I was reminding her of our fun evening without our kids so many moons ago. Giving her that ReGift was me promising her that I will not forget her. I gave her a gift for the future as a gesture of me keeping our friendship alive. Even though almost the entire length of the United States is between us, I want to make sure we get together again, someday, for a Girls' Night Out. And when we do, she won't even have to think twice. Instructions are to grab the Girls' Night Out Bag and hit the town! I would love to hear what your ReGift ideas or memories are. Feel free to share in the comments section.